Bright red switch plates and red outlet covers will jazz up your red enamel kitchen or a bold statement wall in your contemporary dining room. You'll find standard as well as oversized red wall switchplates and receptacle covers in over 50 sizes including modern Decora rocker wall switchplates. To finish out the look of your red wall or a brightly accented room, you can buy matching red phone and cable jacks, toggle or Decora rocker switches, and ground fault outlets to accommodate upgraded lighting or electrical installations. 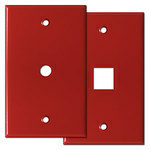 Do you sell red switches and outlets to match these bright red wallplates? Yes we do. 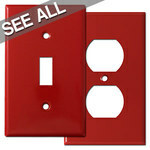 Shop red light switches to find a variety of electrical devices to match these cover plates. 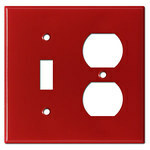 White and black switches are also popular choices for these wall plates. 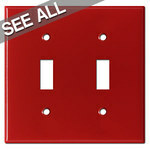 Keep in mind the room in which you plan to decorate with these eye-catching switchplates. Does your kitchen have black granite or black appliances? If so, our black light switches will look sharp. Perhaps you have a lot of white tile, trim or furniture in your room. If that's the case, you may prefer the stark contrast of white electrical devices. Still having trouble deciding? Use the image at the left to select the look that you like best. 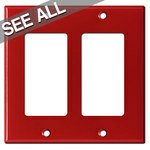 These red light switch cover plates look great but are they durable? Definitely yes. 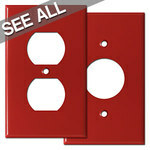 You'll appreciate American-made quality on these versatile fire-engine red switchplates that are constructed from durable .030" steel with a smooth, semi-gloss baked powder-paint enamel finish that is easy to clean and looks great with either gloss or satin light switches and electrical outlets. Plus, with so many sizes, you'll find it's easy to add pizazz to any lighting area in your home of office. I am working with an interior designer to redecorate our home in an Asian inspired design. My favorite color is red but am not sure how bright these red switch plates are and whether they will blend in with my Asian theme. What do you recommend? There are many shades of red incorporated into Asian designs because red is considered a symbol for happiness, health and luck. Our collection of red light switch covers is a very vibrant and intense fire-engine scarlet red which compliments Moroccan, Asian, Indian, Eclectic, Modern, Bohemian, Japanese and 50's style interior designs. My home was built in the 1950s and my husband and I would like to renovate it in the same style. We're going for the nostalgic, retro look to match our black and white checkered flooring. 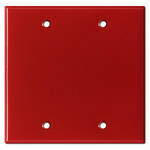 Do you think these red cover plates will flatter our motif? Absolutely. 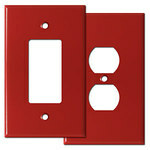 Red switchplates are widely used in remodeled vintage kitchens and in other areas such as bedrooms, living rooms, bathrooms, dining rooms and garages for consistency and to help maintain your retro style throughout your home. From your photos I can tell that this finish is very bright. My favorite color is red and we have a red type of granite stone called Bohus in our kitchen. Would you recommend that we go with red switchplates to match our counter top? You are correct in noticing that our red finish is very vivid. We often compare it to a fire engine red or scarlet red color. While the red switch covers are primarily used in settings that require a pop of color, we advise that you compare our red finish to your countertop to see whether it'll be too busy or not a good color match. If you are going for an intense and bold statement, our red coverplates look best with Dark Rideau Red, Gotic Red, Guazubira, Nelson Red, New Imperial Red, Red Vie, Bohus and Vanga granite stone. I own a hot rod shop and need to add some flair to it. I'd like to replace our dingy switch covers and have been eyeing these red ones. Do you sell these to commercial businesses or are they primarily used in residential homes? Our switch plate outlet covers are used in both commercial and residential applications. Many Asian, Indian and Moroccan restaurant owners purchase this shade to add some color and style to their business. Red switch plates are also frequently used in fire departments, retro car shops and many other commercial businesses, as well as in emergency locations to draw attention to critical switches or outlets. My son wants to be a firefighter when he grows up so we decided to decorate his bedroom in a firefighter theme. We already have a lot of red accessories but I think that switching out the plastic cover plates he has in there for these red ones would be cute. Are these plates advisable for children's rooms? Yes, in fact many of our customers use this red finish in their kids' playrooms, art rooms and bedrooms. The color would be a great match for your firefighter theme and not only are these wallplates durable, they also require very little maintenance.